Spaetzle / Spätzle. 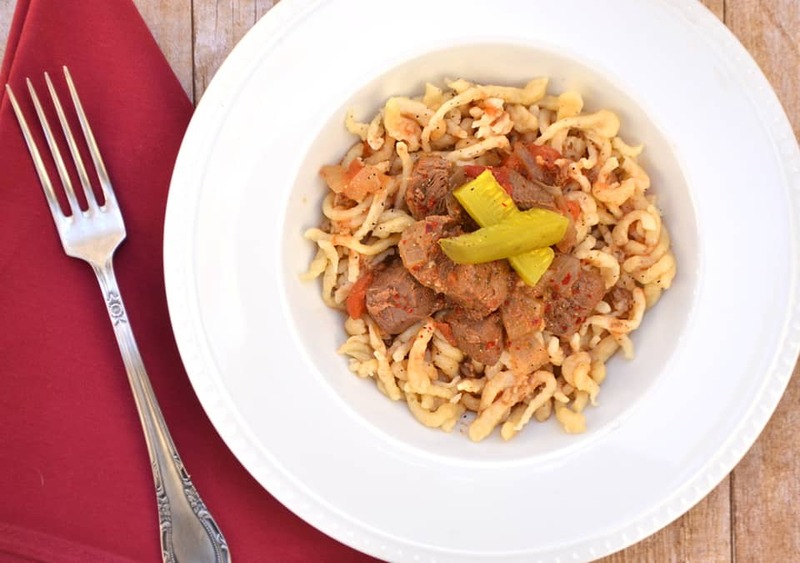 A German noodle that is hearty, delicious & quite simple to make. Total cold weather comfort food. Today I’m sharing my original version & a gluten-free version. Enjoy! We all have foods that bring back memories of yesteryears and the holiday seasons. Though I enjoy the new holiday memories of fresh baked cookies, cakes, breads & meals I’ve created with my family, there is still something that I yearn for during the colder months. Spaetzle. I smile just thinking about it. Looking back, it’s easily one of my favorite things my mom would make for us as kids. My mom, half German & half Italian, came to The United States in the late 70’s. With her she brought her love of European food. I’ve inherited this love as well. Not familiar with spaetzle? It’s the German noodle of choice. It’s almost dumpling texture, with a bit of chew & bite to it, and serves well with hearty and saucy winter foods. 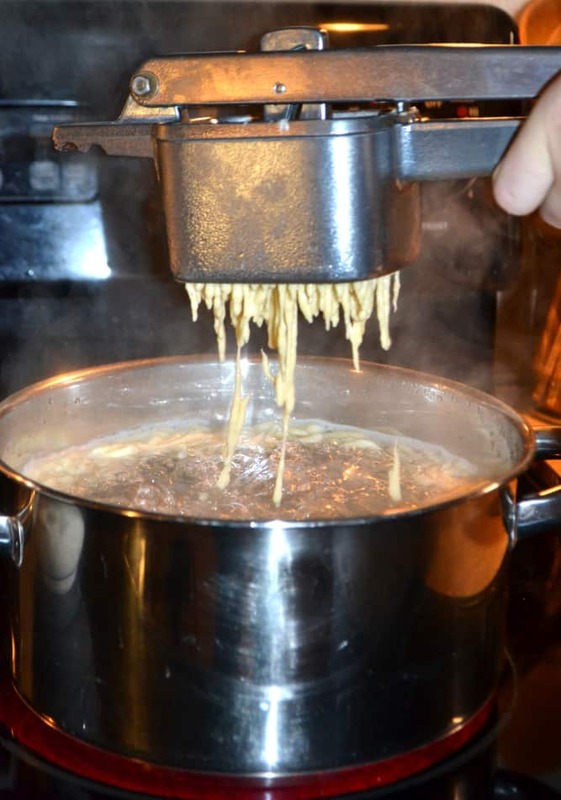 About 5 years ago I got serious about spaetzle and bought a press, the same one I remember my mom using. There are different versions, but this one is tried and true for me. Don’t have a spaetzle press or board? No worries, you have options. A ricer works well or you could just press the dough through a wide holed colander with a spatula. The colander method might be a bit fussy, but it’s still effective. I even tried pushing the dough through a handheld potato masher – it worked well! Though I’ve never tried, I’ve been told a pastry bag works too! 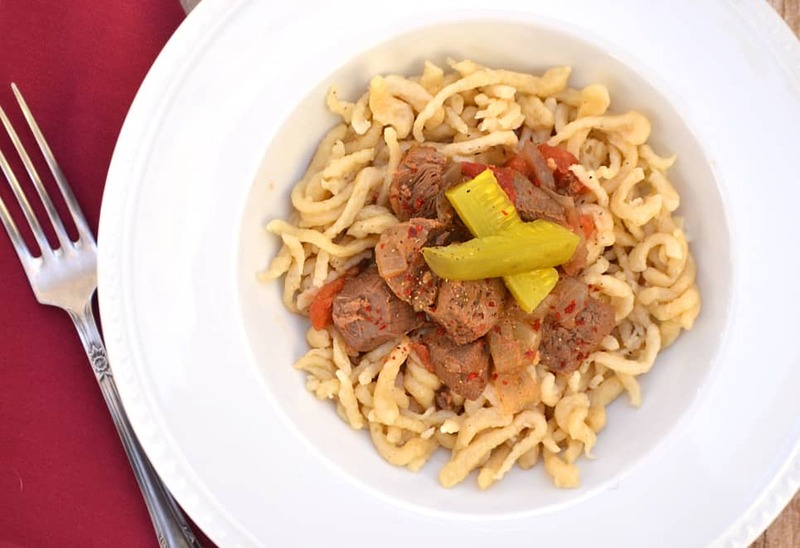 Spaetzle is considered a specialty or gourmet food in The United States. Funny thing is, it’s one of the easiest noodles to make. Mix flour and a few ingredients, push through a press into boiling water and cook until it floats. Which brings me to the topic of flour. One (of many) things I’ve learned over the years is that if you want consistent results with your cooking & baking you need to use quality ingredients. Skimping on the main ingredient, flour, just doesn’t make sense. 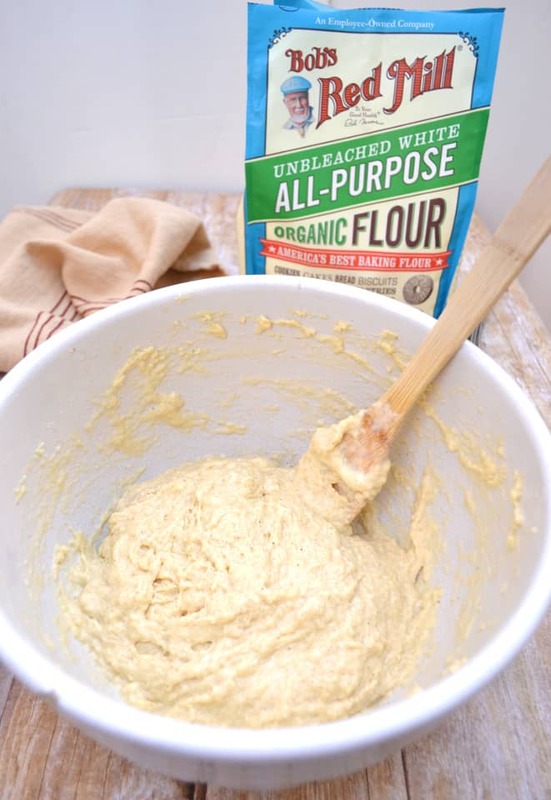 This is why I absolutely recommend Bob’s Red Mill Organic Unbleached All Purpose White Flour. 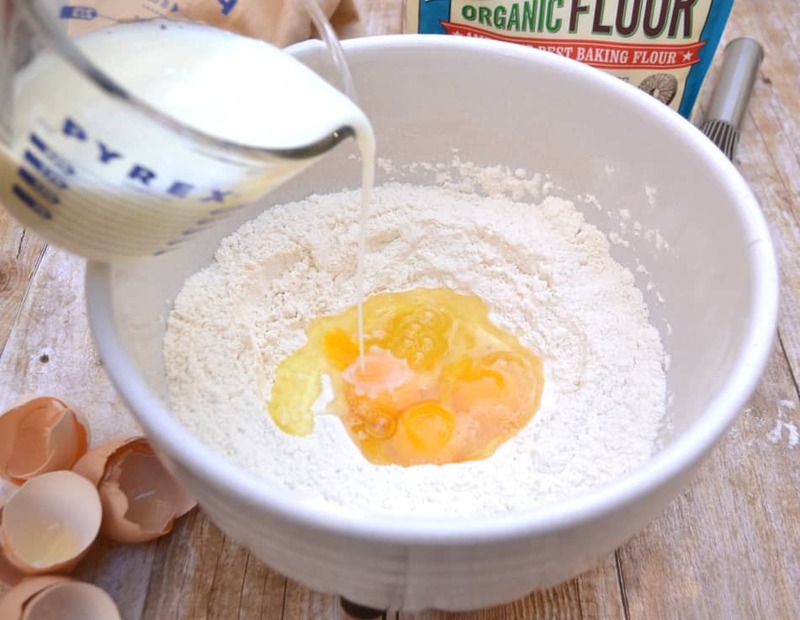 This is the same high protein flour used by professional bakers and produces high, well-textured loaves of bread equally as well as it produces light, airy baked goods and perfect pastas. This kitchen staple is incredibly versatile and perfect for all of your baking needs. Oh, but don’t think I’m leaving my gluten-free foodie friends hanging! 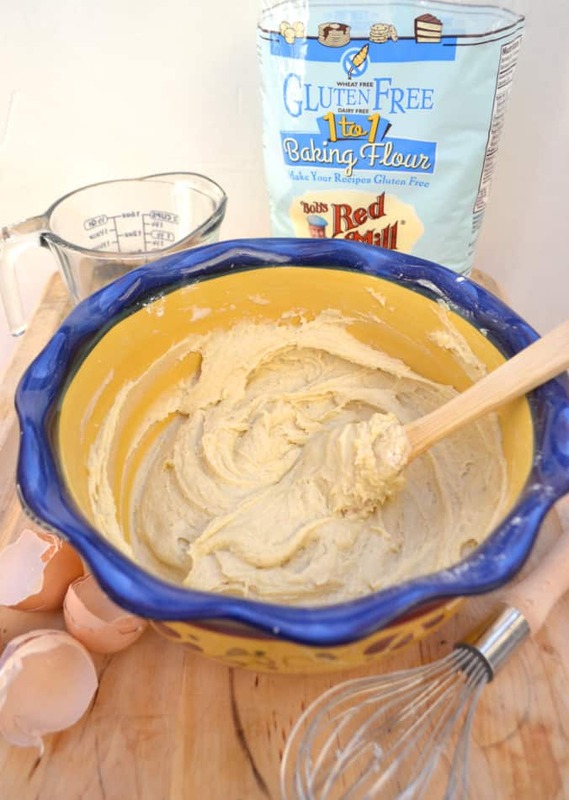 I’m also using Bob’s Red Mill Gluten Free 1-to-1 Baking Flour! It is perfectly formulated for baked goods with terrific taste and texture – no additional specialty ingredients required. Every recipe you got – made gluten-free – it’s that easy. The gluten-free version did involve a little extra attention – I used almost the whole bag of flour to get the spaetzle just right. I’m pretty sure my family have had their fill of spaetzle for quite some time. Anyhow, I have some extra notes in the gluten-free recipe – check them out before you get started. 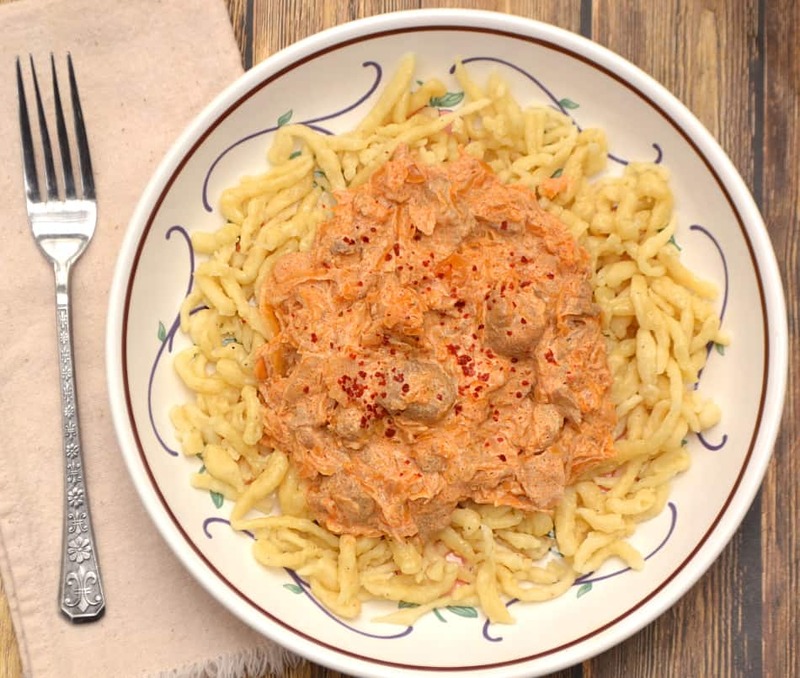 So what are my favorite ways to eat spaetzle? Oh, let me count the ways. Plain, fried in butter, tossed in brown butter, with a thin sauce, with a thick sauce, with a cream sauce, with a soup or stew, with an Eastern European style goulash, with stewed meat, without meat, even with bacon and a sunny-side up egg on top of it. I love spaetzle! 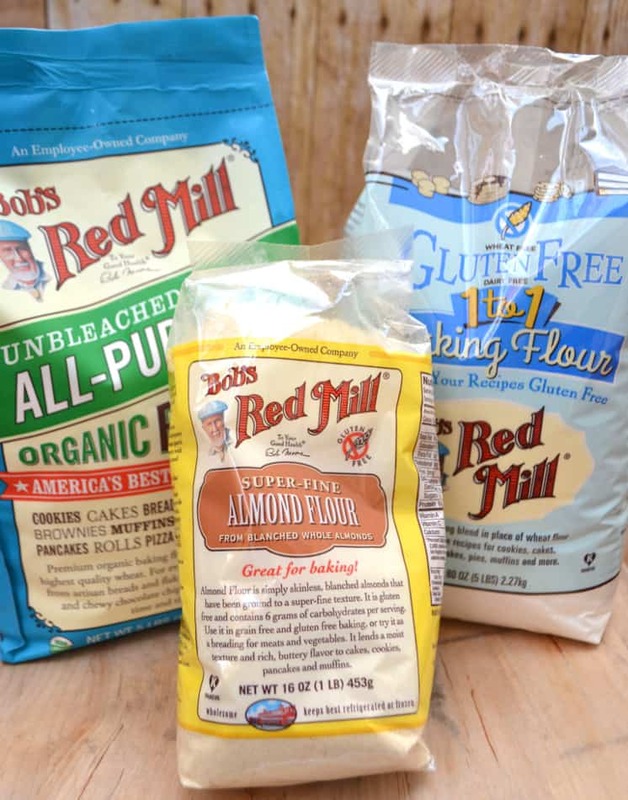 Visit Bob’s Red Mill for recipes, inspirations, tips & ALL your baking needs! Spaetzle / Spätzle. 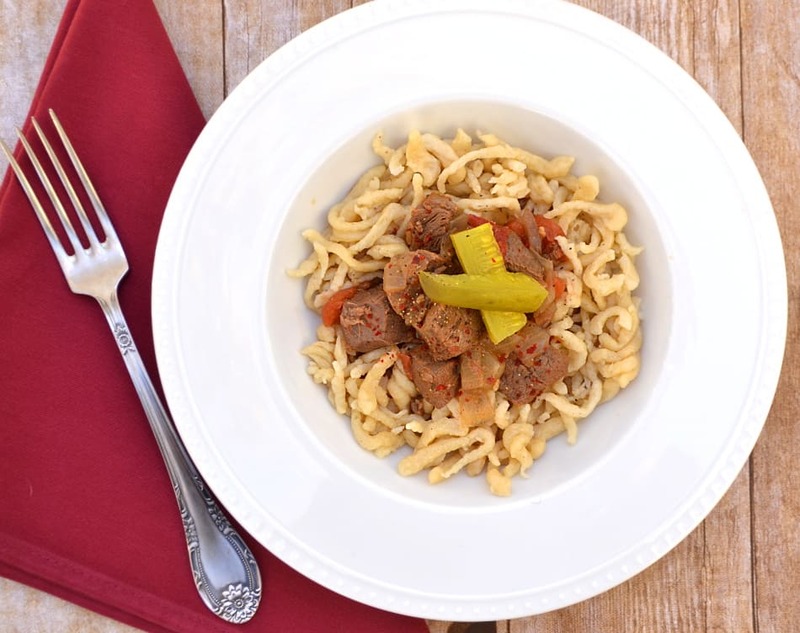 A German noodle that is hearty, delicious & quite simple to make. Today I'm sharing my original version & a gluten-free version. In a large mixing bowl - whisk together flour, salt & nutmeg. Add in eggs and milk. Press in spaetzle. Do not overcrowd pot - you will have to cook a few batches. Stir a few times and cook until it floats. Let it simmer for another minute or two. Remove spaetzle with a slotted spoon and continue with remaining batter. I like to add a tablespoon or two of butter to bowl of cooked spaetzle to keep it from sticking while cooking remainder. Press in spaetzle. Do not over crowd pot - you will have to cook it in a few batches. Stir a few times, cook until it floats & let it simmer for another 3-4 minutes. I like to add a tablespoon of butter to bowl of cooked spaetzle to keep it from sticking while cooking remainder. I found the gluten-free spaetzle to hold much more water, so tossing it in a colander in the sink helped get rid of some of the extra liquid. Serve immediately. If not serving immediately, I suggest rinsing the spaetzle with cold water. It seems to stay plump, keep a nicer texture and not get so sticky this way. 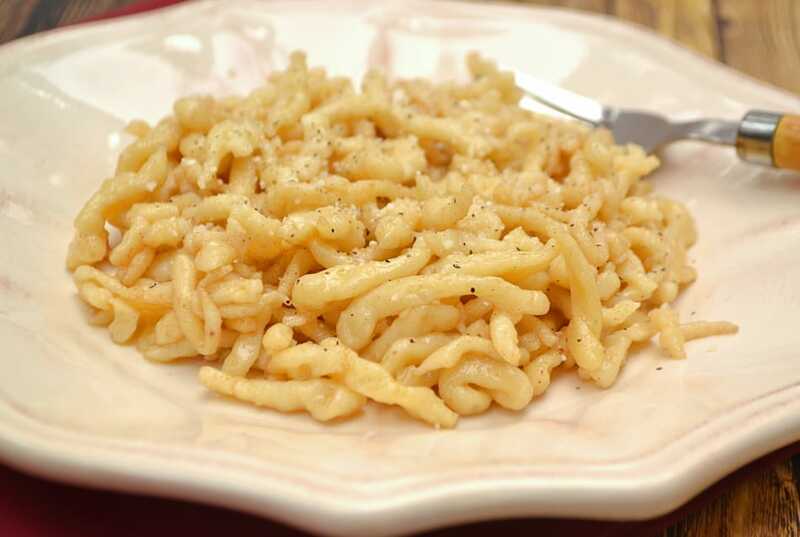 Gluten-free spaetzle can be tossed/drizzled with butter or brown butter or served with any sauce or stew you desire. I don't recommend pan frying it with butter - it got a little globby when I tried. I fussed a lot with this recipe - but each time I served it with a sauce or meal, no one noticed it was different / gluten-free. 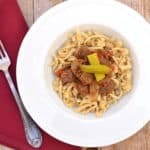 Try it with Hungarian goulash!!! Amanda , I love Spaetzle and my daughter is Gluten free it’s been a problem for the family. This is still one of my favorite things to eat! It always tastes so stinkin’ good!!! Super! We love Spatzle here and these meals look delicious!